The Montego Bay Convention Centre opened its doors in 2011 as the perfect venue for conventions, trade shows, banquets and theater-style conferences. The centre was built as a response to a growing need for meeting and convention facilities on the Island of Jamaica. The centre was constructed by the Government of Jamaica in conjunction with the Chinese Development Bank. Soaring ceilings add volume to the 57,525 square feet of contiguous exhibit space, which accommodates general session setups and up to 260 exhibit booths. This space may be sectioned into two halls with separate loading entrances for simultaneous shows. Loading docks and direct drive-in access to each hall makes setup easy and efficient. Each section is equipped with its own concessionaire stand as well as floor bays for provision of power, data lines, water. 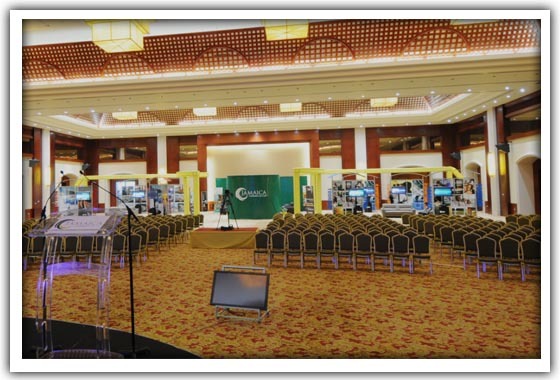 Additionally, each section of the hall has attached office spaces for the meeting planners and internet kiosks for fast private browsing. The Grand Ballroom spans 18,684 square feet with banquet seating for up to 1,260 guests. 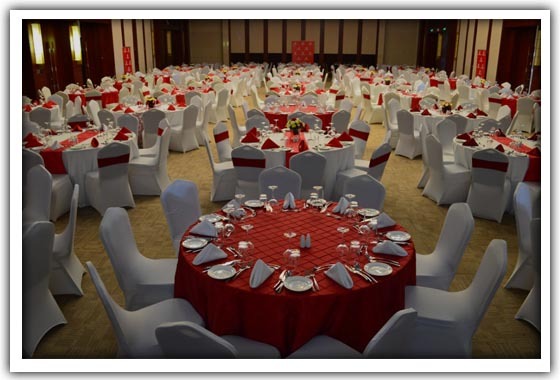 Pre-function and break out areas extend the ballroom space by 6,286 square feet. A marvel of architectural design, the Grand Ballroom is divisible into three sections and features track lighting, surround sound, fixed stage lighting, wireless internet access, plush carpeting and beautiful Chinese inspired decor. Offering 10,161 square feet of flexible meeting space, Montego Bay Convention Centre’s nine meeting rooms (some with natural lighting and views of the Caribbean Sea) can accommodate events of all varying sizes. Whether it is a large meeting with 600 persons theatre style or an intimate board meeting for 10 delegates our rooms can accommodate you. Our meeting rooms are sound proofed and have track lighting, surround sound and numerous meeting essentials to successfully deliver your meeting message. 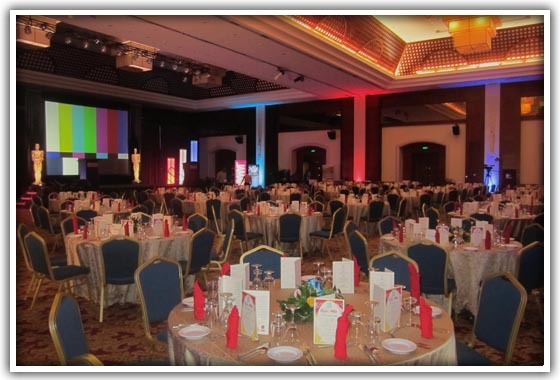 Projectors, screens and state-of-the-art audio/visual capabilities are also available and our Business Centre is equipped to support any business transaction needed to keep your event operations running smoothly. 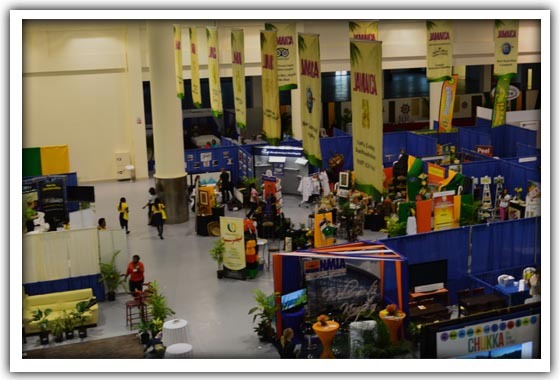 The Montego Bay Convention Centre’s exhibition halls feature flexible configurations and complete amenities and access. The facility features two loading docks with direct drive-in access, and service providers offering the latest technology infrastructure to enhance your presence and message. Our resources are designed to help you save time and money, increase exposure to attendees, and create great business opportunities for you or your business. With 57,525 square feet of meeting space.